In large glass bowl, mix Marinade ingredients. Place beef in resealable food-storage plastic bag. Add marinade; seal bag. Place in 13x9-inch (3-quart) glass baking dish. Refrigerate 4 to 8 hours, turning beef occasionally. Heat oven to 375°F. Remove beef from marinade; place in baking dish. Remove any onion from beef. Discard marinade. 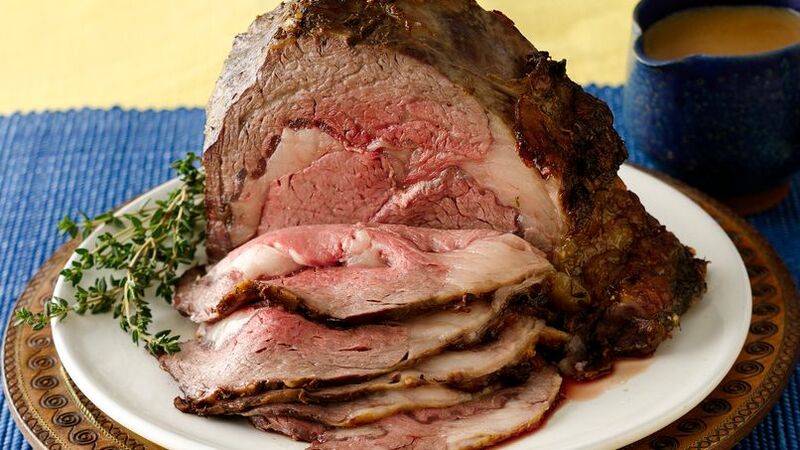 Roast 1 hour to 1 hour 30 minutes or until meat thermometer inserted in center reads 125°F to 135°F. Cover; let stand 20 minutes. Meanwhile, in 3-quart saucepan, melt butter over medium-high heat. Beat in flour with whisk until smooth. Gradually stir in beer and broth. Stir in remaining Sauce ingredients. Heat to boiling. Reduce heat; cook, stirring occasionally, until sauce thickens slightly or to desired consistency. Cut beef across grain into thin slices. Serve beef with sauce. Serve with steamed buttered green beans. When removing the beef from the marinade, make sure to also remove the onions. Love beef? How about a wonderful marinated roasted rib eye? With the beer-mustard sauce this will be a hit for your guests.